Chief minister of Himachal Pradesh congratulated Indian army for surgical attack in Pak occupied Kashmir. Indian army did surgical strike attack against terrorists camps in Pakistan across LOC. He praised this step of surgical strike and said terrorists cross border and attack Indian Army. In response of this terrorism this was right step by Indian army, Virbhadra Singh added that in this attack several terrorists had been killed and no casualty took place to citizens of Pakistan. Chief minister and congress star leader Virbhadra Singh denied allegations of Dhumal and opposition that jobs have been given from backdoor. He asked Dhumal and opposition to tell even a single issue in which jobs had been given from backdoor. Virbhadra singh attended dozens of rally's in Changar assembly constituency area Jaisinghpur. 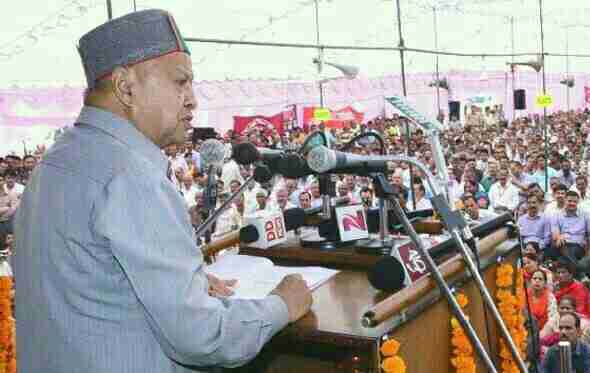 Virbhadra Singh attacked former chief minister Prem Kumar Dhumal that he had habit of lie. How can be there backdoor entry in jobs, when these all jobs are under observation of public service commision and HPPSC Hamirpur. He said Dhumal keeps lie without thinking about God. He said tickets to candidates are given by mutual efforts of central leadership and State leadership. Virbhadra Singh wants to lead party in coming state election in 2017 . When he was asked about state CM candidate of congress party he said he is still young and there is no intention to retire from politics. So it's clear Virbhadra wants one more chance and want to lead party in coming Himachal Pradesh election in 2017. After lots of problems within party , with GS Bali and congress party state president sukhvinder Singh sukhu , it will interesting to watch how Virbhadra manages his leadership in coming elections.